We hope these common FAQs will help answer your questions quickly and easily, but if you need further assistance on any matter, please contact AAAS MemberCentral Support and an associate will be happy to help you. When contacting us, please reference your 8-digit AAAS Member Number. For billing errors, please include/have ready a copy of your confirmation email, so that we can easily locate your Membership record. How do I become a AAAS Member? If you would like to become a AAAS Member, go to our join page to learn more. If you have any additional questions, feel free to contact MemberCentral Support. If you joined online you gain immediate access to Science online content and AAAS MemberCentral features including My Profile and Partner Benefits. The timing of receiving your first issue of Science depends on whether you opted for digital or print delivery. I joined by mailing in a form or calling MemberCentral Support. If you joined AAAS by returning a physical mailing form or by calling in and giving us your email address, you will receive a welcome email once your order is received and processed. This email includes instructions on how to create your online account which provides access to Science online content and AAAS MemberCentral features including My Profile and Partner Benefits. When will I receive my first Journal? I have a digital Membership. If you requested the digital delivery of Science you will receive your first issue via email 1-2 weeks after receipt of payment at sciencemagazinedigital.org. I have a print Membership. If you have opted for print delivery, please allow 2-3 weeks for your first issue of Science to be mailed, (plus actual delivery time to your location). My Profile is self-service online portal, enabling Members to update and manage their AAAS account themselves; resetting passwords, updating contact and address information, joining or changing a section, and more. Within a few weeks of the start of your Membership, you will receive your welcome kit, as well as a series of emails further detailing your Membership and its benefits. A PDF version of the welcome kit is also available for Members to download and print from the website. When will I receive a Member Card? Your AAAS Member Card is included in your welcome kit, which you will receive in the mail in the first few weeks of becoming a AAAS Member. I'm having trouble logging in with my AAAS ID. If you’re unable to log in, please contact MemberCentral Support and an associate will be happy to assist you. Where can I find information about my Membership? You can refer to the confirmation email you received for several details regarding your Membership. This email serves not only as a receipt, but confirms your AAAS Member Number, delivery type, order date, outlines benefits, and more. You can also log into My Profile to review details of your Membership and make updates. How do I set up and/or update My Profile? What do you do with the information collected under personal information in My Profile? What Journals do I receive as part of my Membership? Each Membership includes a subscription to Science. Members can also subscribe to Translational Medicine, Signaling, Immunology and Robotics. For more information about each of these publications, visit the Journals page of our website. How do I sign up for additional journals? Each Membership includes a subscription to Science. Following is information on all our journals and links to more information about each. The premier global science weekly. An innovative and high-quality open access journal for all the sciences. Integrating medicine, engineering and science to promote human health. The leading journal of cell signaling and regulatory biology. Research articles that report critical advances in all areas of immunological research, including important new tools and techniques. Original, peer-reviewed, science- or engineering-based research articles that advance the field of robotics. What newsletters do I receive as part of my Membership? As a AAAS Member you will automatically receive our monthly Member Update and our weekly Policy Alert. How do I sign up for additional newsletters/update my newsletter preferences? As a AAAS Member you will automatically receive our monthly Member Update and our weekly Policy Alert. You have the option of opting out of these and/or into others by visiting our Get Our Newsletters page. Please note: If you renew your Membership, you will automatically be opted back into the Member Update and Policy Alert emails even if you had previously opted out. If you do not wish to receive them, please remember to reset your preferences after renewing. How do I contact AAAS MemberCentral Support? When contacting us, please reference your 8-digit AAAS Member Number. For billing errors, please include/have ready a copy of your confirmation email, so that we can easily locate your Membership record. What is my AAAS Member Number? You can locate your AAAS Member Number in the welcome email you received after joining AAAS, your confirmation email and by logging into My Profile. If you receive the print version of Science, your Member Number is above your name on the mailing label. I forgot my AAAS login ID/password. Your AAAS login ID is the email address you have on file with us. If you have forgotten your password, please use the “Forgot Password?” link on the login screen and follow the instructions provided. If you require additional assistance, please contact AAAS MemberCentral Support. What do I have access to online? All Members have online access to: The Journal Science, Science archives, News from Science and limited specialty journal content at Sciencemag.org, Trellis and My Profile. Can I change my Membership from print to digital (or vice versa)? You may change your delivery type at any time during your Membership by contacting AAAS MemberCentral Support. What are the different AAAS Membership types? AAAS offers six types of Memberships – Student, Post-doc, Regular, Teacher, Retired and Science advocate. Learn more here and join today! What is my AAAS Membership type? The Membership type you selected can be found in your confirmation email. If you no longer have that email, you can also find it by logging in to My Profile. You may change your Membership type – regular, post-doc, student, teacher, retired or science advocate -- at any time by contacting AAAS MemberCentral Support. Please note: some fees may apply. I lost my Member card, can I get a replacement? Please contact AAAS MemberCentral Support and we would be happy to assist you. Your Membership end date is listed in your My Profile account. Simply log in and you will find it mid-way down the Profile Home page. You may renew your Membership and/or sign up for auto-renewal on our online renewal page at any time, through a renewal form you may have received in the mail, or by contacting AAAS MemberCentral Support. When will I receive a Membership renewal notice? Six months before your scheduled expiration date we will begin sending you a series of reminders to renew your AAAS Membership. Our online renewal page offers the option to sign up for convenient auto-renewal of your Membership. Why did I receive a renewal notice when I already renewed? If you have recently renewed your Membership, please disregard any future reminders. It may take several weeks for our systems and processes to fully update -- we thank you for your patience. You can verify your renewal was processed by using your Member Number to log in to our online renewal page where your expiration date is listed in the bottom paragraph under the heading “AAAS Membership Renewal.” If you don’t remember your Member Number, you can find it by logging into My Profile using your email address on file. How do I sign up for and/or discontinue auto-renewal? You can update your auto-renewal preferences by logging in to My Profile and selecting “Update my Payment Information” on the left-hand side. If you would like to renew now, you can do so on our online renewal page, as well as sign up for auto-renewal. I need an invoice for my Membership dues/renewal. If you require an invoice for your Membership dues, please contact AAAS MemberCentral Support. I need a receipt for my Membership dues/renewal. Your new Member confirmation email serves as a receipt for your Membership dues. For all Membership, Science Immunology, Science Robotics, Science Translational Medicine, and Science Signaling receipts, and/or if you no longer have your Member confirmation email, please contact AAAS MemberCentral Support. Member dues paid in excess of $74 are tax deductible as a charitable contribution. For example: If you paid $25 for your Membership, none of it is tax deductible. If you paid $95, then $21 is tax deductible. Your membership entitles you to significant discounts with a variety of AAAS partners including Travelers Insurance, Subaru, Apple, Office Depot, NASA Federal Credit Union and more. Click here to learn more. AAAS offers a wide variety of free career resources including e-learning courses, webinars, podcasts, job listings and more. And, AAAS Members enjoy a 20% discount on AAAS Career Development Courses. Learn more on our career development page. Your Membership includes a subscription to Science. Members can also subscribe to Science Translational Medicine, Science Signaling, Science Immunology and Science Robotics. For more information about each of these publications, visit the Journals page of our website. When will I get my print journal? If you have opted for print delivery, please allow 2-3 weeks for your first issue of Science to be mailed, (plus actual delivery time to your location). 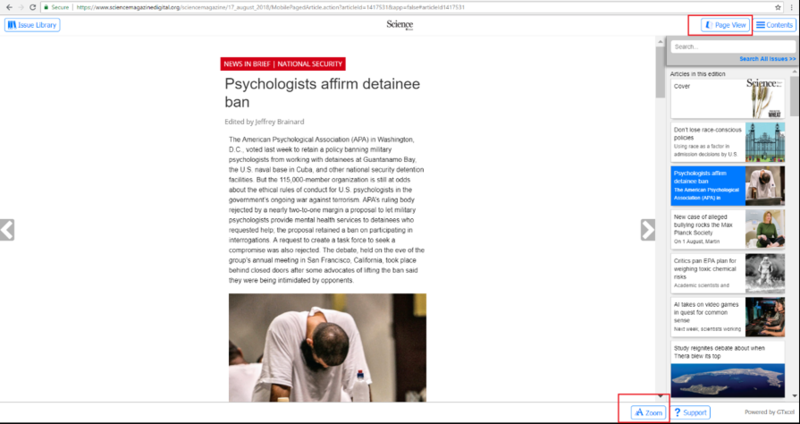 As a member you can view online at science.sciencemag.org. My journal didn’t arrive, can I get a replacement issue? Occasionally an issue is delayed or lost, we apologize if you are having trouble; if you’re in the U.S. and it’s been 2 weeks or more, please contact AAAS MemberCentral Support and we will be happy to assist you. International members, please allow up to 4 weeks. Can I get a copy/an additional copy of a journal? Additional copies of recent and archived issues of Science can be purchased, pending availability, for $15/copy, plus shipping & handling. You may browse availability and order an issue here. How do I suspend delivery of my print journal? If you would like to suspend delivery of Science, please contact AAAS MemberCentral Support and someone will assist you. When will I get my digital journal? If you requested digital delivery of Science, you will receive your first issue via email 1-2 weeks after receipt of payment. This email comes from “Science Magazine” and will arrive in your in-box early each Friday. You also have early access to the Journal online at science.sciencemag.org. Can I order a specific article from the journal? If you are a Member of AAAS, you have access to all Science articles, as well as the articles to any of the journals to which you subscribe (Science Translational Medicine, Science Signaling, Science Immunology, Science Robotics). Advances is an open access journal and membership/subscription is not required. How can I print a copy of my digital journal? If you would like to print a copy of your digital journal you receive weekly via email, you must first download a copy to your device. You can do this by clicking the “Download PDF” button located at the top of the Table of Contents on the right-hand side of your screen. How do I navigate my digital journal? Use the side arrows located to the left and right of the magazine. 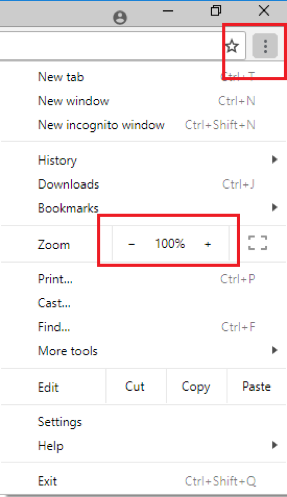 Hover the mouse over the edge of a page in the middle and an arrow will appear. From the Contents page, click on the page number of the article you’d like to read and be taken directly to that specific page. I’m having trouble with the display of my digital journal. First, check your browser to ensure it is not expanded. As shown in the image below, there are 3 dots in the upper right side of your screen that render a menu of options when you click on them. If your zoom is set for higher than 100%, it may cause distortion. You can adjust it using the “+” and “-“ buttons to either side. In each version there is a zoom option at the bottom of the screen, per the red boxes in the images below. If you continue to experience difficulty, please contact AAAS MemberCentral Support and an associate will be happy to help you. How do I search for a specific topic or article? 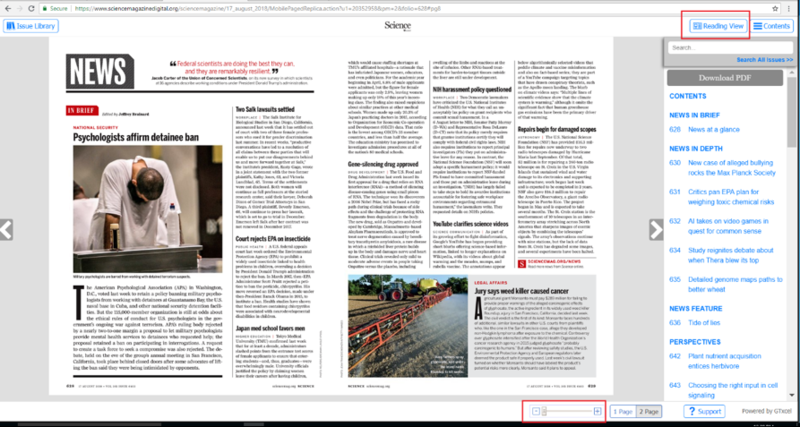 To search the current issue, click on Search to find an article, phrase or word in the current issue. Click on Advanced Search in the Search folder to refine your search further. You can select this issue or all issues from the drop-down menu. Three divisions fulfill the AAAS mission within their respective territories, bringing together scientists and nonscientific communities to discuss issues with immediate local impacts. You can learn more by visiting our Divisions page. What is the AAAS Elected Fellows Program? AAAS members are eligible for nomination as a Fellow. You can learn more about Elected Fellows on our website. Sections are committees representing various scientific disciplines. Responsibilities include nomination and review of Fellows, and proposal of symposia for the AAAS Annual Meeting. Sections provide a great networking opportunity, as well as interaction with AAAS leadership on important issues in the scientific community. What Sections does AAAS have? AAAS has a total of 24 Sections, all of which are listed on this page. How do I sign up for a Section? All Members of AAAS can join up to three Sections. To join or update your Section affiliations, simply log in to My Profile and click on Edit My Sections. How do I make a change to my section preferences? To join or update your Section affiliations, simply log in to My Profile and click on Edit My Sections.